It appears that smartphones have taken over as the go-to gadget for everyone's photography needs. It's small and portable and, if you're like most people, you almost always have it on your person. Over the years, although the quality of photos taken on a phone has steadily improved in quality, you were always limited by the restrictions of the lens. If you own an iPhone, that's no longer the case. 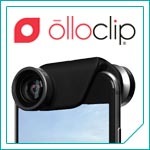 The olloclip 4-in-1 iPhone lens is an easy-to-use solution for those looking for the chance to vary their photos with the use of alternate lenses. It's a quick-connect lens system that clips onto the corner of your iPhone, giving you access to a fisheye lens, a wide-angle lens and two macro-lenses (10x and 15x). There is also a telephoto lens, which is sold separately. The lenses are made of precision-ground coated glass while the barrels are formed from aircraft-grade anodized aluminum for strength and durability. The entire system fits in your pocket or the palm of your hand and it's available on the olloclip website. The lens kits for iPhones 4 and 5 cost $69.99 and the iPhone 6 system is $79.99. There are also kits available for iPad and the Samsung Galaxy. There's even an olloclip app available on the iTunes store to further assist in taking your phone photography to the next level.